The all important question that rises above and before ALL other questions is the one of evidence. Is there any evidence that carbon dioxide causes major warming? In science, “evidence” has a very specific meaning and for a very good reason. In a court of law or a game of football, the label “evidence” can be plastered all over the place. If 500 footballers signed a petition to change a rule, that would be “evidence” the rule needed changing. But if 5 billion people signed a petition to make it rain in Mumbai on Thursday, that’s a waste of paper. Science is only about the natural world. That’s why human opinions are irrelevant. Empirical - That which we can see, hear, record, or write down. A measurement of some sort. An observation of the natural world. Related to CAUSE and EFFECT. That means evidence that shows that our extra carbon caused most of the recent warming. Not just evidence that the world has got warmer (which could be due to some other reason). Evidence that shows carbon has a major role, that doubling the level of atmospheric carbon dioxide would cause, say, 2 – 10 degrees of warming. If doubling carbon only causes 0.5 degrees of warming, who cares? It doesn’t matter how many associations, unions, or Nobel-Prize-winning Saints believe in a theory. If they claim there is evidence, by thousands of scientists in peer reviewed papers, then it should easy for them to provide it. The problem is, all those thousands of papers are either not empirical, not related to the cause of the warming, or do not show carbon has a major role. When we talk about the “Major Role”, we’re talking about Feedbacks. Nobody who is anybody believes doubling carbon on it’s own will warm us by much more than one degree C. The Pachuri-Gore-Hansen Team ($$) believe this warming will then cause changes in other factors (like humidity) which will then cause much more warming. The history of humanity is full of people who were absolutely dead-set sure, and completely wrong. Climate models are not evidence: they are imperfect “simulations” of the climate, not the climate itself. Our global atmosphere is a messy algorithm, with oceans, clouds, rain, water vapor, solar wind, magnetic fields, forests, ice-cover, glaciers, volcanoes, heat from below, and moving dust clouds of soot. It’s just not possible to simulate the real atmosphere without making assumptions, estimates or decisions on which parts to simplify or omit. Since all those things rely on the opinions of the modelers, no matter how well intentioned or educated they are, a model is a glorified opinion. When people claim they have lots of evidence, notice closely whether they can back that up. This thread is for discussing papers that may fit the bill above. A lack of evidence (or even a mass of evidence that points the other way) will not win us the PR war. That’s a different debate. IMAGE Credit: Thanks to Taw for the image I manipulated. 123 comments to Is there any evidence? I get the impression that even a few Alarmists are beginning to feel uncomfortable – ClimateGate, lack of warming etc. etc. So our old friend Ocean Acidification(OA)is starting to be wheeled out centre-stage. As CO2 is not being helpful as a bad guy in the atmosphere, the tack will change. Global Warming – became Climate Change when no warming occurred. Now the threat will be OA which we will be told is happening too FAST for nature to adapt and evolve. Frank S . – Yes the problem now is that a lot of people stand to lose a lot of funding, and many like Charles Clover a lot of face. They are just hoping that the scales do not slide from too many eyes before they can get out the other side with a pension. 1. Make the case that a warmer world would be bad. 2. Make the case that Global Warming is man made. 3. Make the case that we can do something about it. Fail any one of those and it doesn’t matter. Just how much evidence DO these idiots need??? Don’t worry, all will be well and not just because I am an optimist. I know of no empirical proof that man is having any discernible effect on the climate. The economy is in a precarious state and people are beginning to feel the long arm of the government reaching for their wallet. People are generally tolerant until you propose action that will impact their lifestyle in a negative manner. Although I am of the opinion that global warming is the greatest fraud ever perpetrated upon the people of this planet most people would oppose action that would have a detrimental impact on their lifestyle even if AGW were proven beyond a shadow of a doubt to be the unvarnished truth. Think about it, communism and socialism involve sharing everything equally and anarchy is based upon the abolition of all law and everybody being free to do whatever they want. Every attempt to base a society on the aforemetioned systems has been an abject failure. The only system that has worked is one based on self interest and greed: capitalism. Years from now I will be watching youtube vignettes of young scientists predicting global cooling, then global warming in their middle age and finally in their golden years promoting whatever potential catastrophe they can imagine to keep the frightened taxpayer footing the bill for their unnecessary research. What a sad waist of valuable resources and money. The alarmists insist on prefacing their arguments with the silly notion that “everyone agrees” about CO2 being responsible for increased warming. This, despite the fact that warming has historically preceded increased atmospheric CO2 concentrations by decades. Now we learn from a new study by Wolfgang Knorr of the Department of Earth Sciences at the University of Bristol that there has been no rise in atmosphereric CO2 levels for the past 160 years. Please don’t hold your breath waiting to read this news in the papers. Eddy – I share most of your sentiments. I would, however, modify the depiction of capitalism as simply “self-interest and greed”. Every person on earth has “legitimate” self-interests – food, shelter, water, sanitation, productive work and the rewards from that legal activity. “Greed” is harder to define, as it can be relative, based on your perspective. To some, any profit qualifies as “greed” – of course, these people have never started nor maintained a private business that must generate a profit in order to keep the doors open and the employees hired. A market or economy, restrained by laws that protect against egregious dishonesty, will determine what is “greedy” by allowing the consumers to decide based on their perception of value. The less government interference, the more free the consumers are to make that decision since they have more disposable income due to less oppressive taxes. I am old enough to remember the first Earth Day, the Global Cooling scare, the End of Oil by 2000 prediction by the Club of Rome, the Population Bomb tripe by Ehrlich, etc., etc. The scare-mongers never cease their attempts to find a new boogey-man to frighten the public. Attention JoNova – I object to the emoticon assigned to my post. I am not an angry person – quite the opposite. Very even-handed, diplomatic and fair in my written posts (if I may say so myself, which I believe I just did). Is there a way to choose our emoticon or change that which is assigned to us, or is it purely random? BTW, thanks for all your work this year at exposing the warm-mongers and their scam. I learnt in high school chemistry that a system in equilibrium will always oppose any change. It’s not magic, just the nature of equilibrium. If a system has positive feedback then it won’t be stable. The least random change will cause positive feedback, which will cause the system to move to a new state until it finds an equilibrium where all feedbacks are negative. If the earth’s climate had positive feedback to temperature changes, the earth’s temperature would have shot off to boiling hot or freezing cold eons ago, never to return. A stable system with positive feedback would be so extraordinary that it would demand an overthrow of current theories of physics and chemistry. To simply assume positive feedback shows that no science is involved. I fell for the oldest con also. Shine the light of truth on this and you will see that it is just another example of the Prols being lied to by those in power. By 1951, what has been called the Modern Russian-Ukrainian Theory of Deep, Abiotic Petroleum Origins was born. A healthy amount of scientific debate followed for the next couple of decades, during which time the theory, initially formulated by geologists, based on observational data, was validated through the rigorous quantitative work of chemists, physicists and thermodynamicists. For the last couple of decades, the theory has been accepted as established fact by virtually the entire scientific community of the (former) Soviet Union. It is backed up by literally thousands of published studies in prestigious, peer-reviewed scientific journals. For over fifty years, Russian and Ukrainian scientists have added to this body of research and refined the Russian-Ukrainian theories. And for over fifty years, not a word of it has been published in the English language (except for a fairly recent, bastardized version published by astronomer Thomas Gold, who somehow forgot to credit the hundreds of scientists whose research he stole and then misrepresented). This is not, by the way, just a theoretical model that the Russians and Ukrainians have established; the theories were put to practical use, resulting in the transformation of the Soviet Union – once regarded as having limited prospects, at best, for successful petroleum exploration – into a world-class petroleum producing, and exporting, nation. Maintaining the myth of scarcity, you see, is all important. Without it, the house of cards comes tumbling down. And yet, even while striving to preserve that myth, the petroleum industry will continue to provide the oil and gas needed to maintain a modern industrial infrastructure, long past the time when we should have run out of oil. And needless to say, the petroleum industry will also continue to reap the enormous profits that come with the myth of scarcity. Daniel (#7), the Knorr study concludes that there’s been no increase in the airborne fraction of CO2 in the atmosphere, not that there’s been no increase at all. CO2 has increased, but the earth’s natural carbon sinks are operating at approximately the same level of efficiency over the period studied. This is important because it puts the lie to claims that the earth’s capacity to absorb increasing CO2 is being overwhelmed. Just thought I should clarify that! They wanted to pour billions into climate research? Let them! Real scientists are beginning to find the proof we need to shoot down politicized science, and the more research is actually DONE, the better things will look for our side of the argument. 6Eddy Aruda: Don’t worry, all will be well and not just because I am an optimist. I know of no empirical proof that man is having any discernible effect on the climate. The economy is in a precarious state and people are beginning to feel the long arm of the government reaching for their wallet. The battle will be long and hard. We are faced with every political leader in the world and the political bosses of the scientific bodies against us. With the mainstream media completely blanking out contrary AGW news. Everyone is in for the quick buck. Politicians for the tax, climate scientists for the grants and conferences, and the media for the scraps that fall from the sumptuous table. No one is bothered about the economic disaster to come. Perhaps the only one our side is capricious nature, which may just freeze AGW in its tracks. I like your logic. When i first became interested in AGW, about the time that the mechanism for fixing it was going to cost money, i did notice that over the eons the swings of climate looked suspiciously like a sine curve. Obviously the proponents of AGW saw this too hence the “unprecedented warming” and the need to obscure the most recent sine curve; MWP and LIA. Linking the positive part of the natural curve to an increase in CO2 emissions will only work while the curve approaches the peak after which it’s all downhill for the pundits of AGW. Where we must not err again is to allow these same “scientists” to continue in this field. I recall the doctor who was hailed as a hero for discovering the link between Thalydomide and birth defects was later struck off for falsifying results is another area of his research. Mann, Jones etc shouls be struck off if and when their fraudulent science is exposed. Australias CSIRO should also be reviewed for lack of due diligence in accepting poor science as proven fact. Wont happen of course because the govt was also sucked in. Also pitted against the mighty mainstream media is the humble blogosphere. Whereas the mainstream media is silent the internet roars. Glenn (#12, Duly noted. Thanks for the clarification. And the fact still remains that anthropogenic carbon emissions are not causing warming by virtue of their not remaining aloft. Sorry for the typos in #17! Good grief! It’s even more basic than this. The scientific method has four steps: observation, hypothesization, experimentation, and synthesis. A scientist observes a phenomenon; posits a mechanism to explain it (the hypothesis); designs and executes a transparent, repeatable, and most important of all falsifiable, experiment to test the hypothesis; and then, in light of observed data, decides whether the hypothesis is corroborated; falsified and fixable; or falsified and worthless. The warmists have only gotten to stage 2. They have observed a phenomenon (mild warming since the end of the Little Ice Age); and posited a mechanism to explain it (the anthropogenic global warming thesis, i.e. radiative forcing principally due to anthropogenic greenhouse gases produced from burning fossil fuels and manufacturing cement – see the 4th Assessment Report, Chapter 2). But they have not executed stage 3. No one has ever designed or executed a transparent, repeatable, falsifiable experiment that has resulted in observed data corroborating the AGW thesis. On the contrary; the IPCC models (and those of its contributors) have consistently predicted that average global temperatures would rise in lockstep with atmospheric carbon dioxide concentrations. The reverse has happened; carbon dioxide continues to climb, and temperatures have fallen since 2002. There has been no statistically significant warming since 1995, despite a 5+% increase in atmospheric CO2 concentrations. This observed data definitively falsifies the AGW thesis. The problem, though, is more basic still, because according to historical, archaeological and geological data, there is no statistically relevant correlation between change in atmospheric CO2 concentrations and change in globial temperatures over any time scale (again falsifying the AGW thesis; the IPCC predicted that climate “responses” would “scale linearly” with “forcings”). Correlation is not sufficient to prove causation, but it is a necessary component of any causal relationship. The absence of a correlation means that there is no prima facie case to even suspect that CO2 (let alone the 3% of atmospheric CO2 that is produced by humans) plays a significant role in driving climate. And the problem is even more basic even than THAT – because now, thanks to Climategate, we are no longer certain that even the basic temperature record can be trusted. We don’t even know for sure that temperatures HAVE risen mildly since the end of the Little Ice Age! The bowdlerizers at the UEA CRU have denied us even that – all we have are “quality-controlled and homogenized data”. If I tried that excuse with the Department of Revenue on my income tax return, I’d be off to the crowbar hotel in short order. So where does this all leave us? I don’t know about you, my dear, but it leaves me cozied up to my fireplace, where I just pitched another couple of chunks of renewable carbohydrate energy. Because thanks to all this global warming, there’s two feet of snow on the ground, and it’s bloody cold outside. (see Comment No 134 for a curmudgeonly risposte from a Grumpy Old Man). Sorry didnt see that. Yes very clearly AGW is not a scientific theory. A scientific theory must be falsifiable and AGW is not. Thus beautifully fits into such pseudoscience / humbug as astrology. Only it is much better for charlatans and their gullible followers than astrology. Imagine if I read the star charts and predicted it would rain next week. By next week I would either prove to be coincidentally correct or wrong. (In which case I might fall back on the excuse of not noticing that Jupiter was not inline with Mars). AGW on the other hand makes predictions of consequences that will happen decades and even a century from now and urges immediate action on the basis of these distant predictions. Great post, of course the greed part of capitalism was allways meant to be a double edged sword -i.e. it should be the greediest people who tend to get stung the most in the regular and necessary downturns. Unfortunately the truly greedy ones seem have managed to get the pollies to manipulate the market to prevent the downturns. Of course this only means that when the downturns come they will be even harsher than they need to be. It seems to me that the bastardisation of the free markets has been done in a similar way to the science of AGW/CC. It is worth considering that communism seems to have failed because it ignores greed, the irony is that the bastardisation of capitalism and one could argue some areas of science, we now see is due to the same human trait – greed. @ docforesight 8 and Richard 14. Gentlemen, thank you for sharing your thoughts and insights. I remain an eternal optimist. As Edmund Burke said, “All that is necessary for evil to triumph is that good men do nothing.” There has been and always will be people who would rather die on their feet than live on their knees. Because I search for the truth I am willing to listen to anyone who says they have evidence to support the AGW theory. So far I am unconvinced by any of the arguments that I have heard. The whole AGW theory is a red herring. The real aim of the far left is to control the world, abolish our freedoms and impose their way of life upon us all. We as individuals perceive the world through our five senses and not through the collective good of society. Our instinct for survival finds expression through capitalism. Perception begins with the individual and ends with the individual. Capitalism allows one to survive through ones own effort. You can either work for someone else or work for yourself. If the greens succeed we will all be forced to do what the elitist few dictate. Greed, in the sense that “it is all about me” is the reality for all of us. When we have satisfied our instinct for survival we can be good to others as well as possess the largesse to be charitable and to do as our consciences dictate. The “excesses” of capitalism make possible the donations necessary for environmental causes, both good and bad. When I spoke of greed I was referring to the natural desire to want things and I was being a little sarcastic and somewhat facetious. I apologize if I was vague. In order to be generous with others I mist first be generous with myself lest I become a recipient of another’s kindness and charity. As Sophie Tucker once said, ” I have been rich and I have been poor. Believe me, honey, rich is better.” The greens do not seem to realize that people want to enjoy a comfortable lifestyle made possible through modern technology and cheap base load energy. People may not rise up against the AGW fraudsters for the noblest of reasons but they will react with a furious vengeance against those who would force them to live a short, brutish, peasant lifestyle all for no appreciable gain. In the end, the common good is best served by allowing the individual true freedom expressed by this simple but famous statement, “life, liberty and the pursuit of happiness.” The Greens will not rest until they force us all to live in an environmental Mordor. Lets stop them before Al Gore obtains the one ring and in the darkness binds us! the climatic linkages during this Epoch. the calibration of Earth’s climate sensitivity to CO2 is critical for understanding climate change; for today’s Earth, every doubling of CO2 most likely results in a temperature increase [_T(2_)] of _3°C (1). The evidence from the earth’s deep past indicate the climate sensitivity of increasing levels of C02 ppm levels support the computer modeling published in the IPCC 2007 within data coned variability of lower and higher projections. In fact they may well prove conservative. It is noted this blog thinks there is no evidence of higher climate sensitivities with an atmosphere of higher levels of C02 say at 500ppm. Therefore to assert there is no support is patiently false and misleading. The new science “discoveries” on this very matter of climate change support is there for everyone to read. Whether you believe in AGW or DAWG as it has become known as is really in your hands and in your thinking. The internet is filled with convoluted hogwash fringe science. Filtering out the real science from blog science and the hype is a task in itself. And the fact remains there are science papers presenting these empirical studies out there. Any real skeptic should use caution and take the time to investigate. Regards ocean acidification, here is a story I possibly may have made up. “All this CO2 we pump into the atmosphere raises temperatures including that of the Oceans which in turn releases more CO2 from it’s vast carbon sinks leading to yet higher temperatures”. This is not a science argument. You are all on about survival linked to an old fashioned ideal of capitalism and politics. Ross said “The internet is filled with convoluted hogwash fringe science. Filtering out the real science from blog science and the hype is a task in itself”. Well there you go again Ross. Will ye never learn man? The paper you site is a fine one, BUT WHERE DOES IT SHOW CAUSE AND EFFECT? Where does it show CO2 leads temp? We’ve drummed this into alarmists heads ad nauseum, some are just too thick skulled. Earth, every doubling of CO2 most likely results in a temperature increase [T(2)] of 3°C (1)”. Ross DO YOU SEE THE PHRASE “MOST LIKELY?” How accurate is that phrase? are you satisfied science can advance with “most likely?” Will an apple “most likely” fall from it’s tree? Was Neil Armstrong told he will “most likely” end up on the Moon, hence less likely he’ll end up on Mars? The paper also qualifies by saying “in todays earth.” Well what about yesterdays earth from which the author claims proxy data? Was a doubling of CO2 resultant in temp. increases of 3degC in yesterdays earth? IT DOESN”T SAY COZ IT DOESN’T KNOW ROSS. Where is the study on TIME LAGS in the ocean, atmosphere, CO2 and Temp. couplings? Some cycles related to the deep oceans take thousands of years to complete. ANY ALARMIST SHOULD USE CAUTION AND TAKE THE TIME TO INVESTIGATE, RIGHT ROSS? Here we estimate long-term equilibrium climate sensitivity by modeling carbon dioxide concentrations over the last 420 million years and comparing our calculations with a proxy record. Our estimates are broadly consistent with estimates based on short-term climate records, and indicate that a weak radiative forcing by carbon dioxide is highly unlikely on multi-million-year timescales. We conclude that a climate sensitivity greater than 1.5 6C has probably been a robust feature of the Earth’s climate system over the past 420 million years, regardless of temporal scaling. The study of Earth’s climate past supports the computer modeling based on climate data over the last 30 year for projected Climate Sensitivity as the ppm of C02 increases into the atmosphere until 2100. A weak radiative forcing of C02 – and a weak Climate sensitivity as a consequence is highly unlikely based on the evidence of multi-million year time scales. Understand my dear friend that the narrow window on exposing REAL science on this site is like finding a needle in a haystack around here. I will get to your objection about C02 lag in due course and in my own time frame. Do you understand science at all? This is linking increased C02 levels to climate sensitivity at present. I have to peel off the wall of it DOES NOT exist deceit. Do you understand the paper you quoted? Here are a couple of links to put things in perspective. The first link below shows a graph plotting the CO2 content and the temperature of the earth over the last 600 million years http://www.freerepublic.com/focus/f-news/1644060/posts The second shows why the forcings you are qouting are absolute garbage. http://junkscience.com/Greenhouse/forcing.html. If the paper you are citing were correct then how do you explain that during the late Ordovician period 350 million years ago CO2 levels were 4,400 parts per million and we were in the worst ice age the world has ever seen? The rest of my response didn’t show so I will try again. Regarding Kur”schner et al. you left out Their study therefore reopens the possi- bility that CO2 was a prominent force in controlling climate during the Miocene. key word “possibility”, not certainty. As far as your response 27 it is non sequitur as usual. When you go to http://junkscience.com/Greenhouse/forcing.html I can’t wait to hear your “scientific” commentary explaining why Milloy is wrong and Kur”schner et al are correct. It will be a little more challenging for you then a simple cut and paste of an article that is about how CO2 levels effect plant life AND the relationship to temperature. Perhaps you will be able to quote something of relevance this time? You refer to a paper by Dana L. Royer. That paper refers to a paper by Wolfram M. Kurschner et.al. that presents CO2 level as found using a stomatal frequency method and proposes that a gross association between CO2 level and temperature was found. Our data show striking CO2 fluctuations of 600–300 parts per million by volume (ppmv). Periods of low CO2 are contemporaneous with major glaciations, whereas elevated CO2 of 500 ppmv coincides with the climatic optimum in the Miocene. However, due to the extremely poor time resolution, there is no evidence to point to the direction of causality. Did the temperature cause the CO2 level or did the CO2 level cause the temperature? One cannot tell simply from the fact of the existence of a correlation. In fact, you can’t even tell if the found correlation is or is not simply accidental from that fact alone. Both the Rolyer and the Kurschner papers are unresponsive to the basic question at hand. When causality is operational between two factors the factors will exhibit a correlation. However, to demonstrate that the causal connection exists, one must present a mechanism for the connection and demonstrate the mechanism is actually in operation within the given circumstances. Then, once that is demonstrated, one must demonstrate that the cause occurs BEFORE the effect. The paper is devoid of evidence of causality, mechanism for the causality, nor a demonstration of the direction of causality. Can you show the evidence that explicitly meets these criteria in answer to the question? As we have repeatedly said that we have no argument with the fact that climate changes. We also don’t have an argument about the fact that temperature changes. Further, we have no argument with the fact that the level of CO2 in the atmosphere changes. Nor do we argue that correlations can be found among them. What we DO argue with is the mechanism of and direction of the causal connections among those factors. It is exactly this for which we ask clear and unambiguous evidence. The “nor” should be “or”. Same old same old crap response from you Ross i.e. “I will get to your objection about C02 lag in due course and in my own time frame”. Anybody lightly versed with the AGW debate knows that this lag was one of the very first questions raised when the infamous ice core graphs were presented. So surely a man who claims to understand the science would have known we would ask about this lag immediately upon reading the article you sited. Why didn’t you prepare a response? Indeed why didn’t you head off queries by answering the question in your post? The above quotes are from the 2nd paper you sited. The first paper is riddled with just as many maybes probablies and assumptions. Is this the “Solid peer reviewed” literature you would have the rest of us agree to spend trillions of dollars and turn our economies upside down over? On to the fall of 1999, when the IPCC was its all-important “Summary for Policymakers” which featured the notorious graph flatlining the Medieval Warm Period into pictorial nonexistence and displaying a terrifying, supposedly unprecedented surge in 20th-century temperatures. Always good to go to the scientists themselves when you need the facts. ” The fact is that there is no such thing as “settled” science. Maybe you can get these scientists to release their raw data so their results can be verified? They refuse to do so and, as Jones promised, the raw data has been “disappeared.” Oops, they “lost” it! Maybe you can arrainge a debate between the experts on national TV? For some reason they refuse to debate. Regarding “Ocean Acidification”, there is no such thing as an acidic ocean anywhere on the planet. Seawater is always a pH greater than 7 so if there is any effect then the correct term would be “Ocean Neutralisation”. Only once the seawater pH dropped below 7 would acidification start to occur. Regards EVIDENCE and climate models (GCM), the 2 papers you site Ross rely heavily on GCM’s. As you may well be aware, us skeptics don’t place much value on GCM’s as “evidence”. So could you please dig deep into the sediments of your reservoirs of knowledge on all things global warming and explain to the rest of us what a GCM is, how is it operated (do red lights starts flashing and big steel doors slowly start closing and incessant buzzer alarms going off when the operator hits the start button). Can you tell us the difference between inputs and outputs, and what consequences might we expect if an input is confused with an output. How long does it take to input all the data, known and presumed. How long does it take to crunch this data, outputting a result. Of the 20 plus GCM’s in use around the world, how closely does their output match. Do GCM’s presume earths climate is chaotic or stochastic? How accurate can GCM’s be in either condition. How is a GCM calibrated. What procedures (or data torturing) are used to make GCM’s mimic past climate data. The above should keep you going for a couple of weeks. When you’re done, I have the other 90% of questions regards GCM’s ready for you. Come on Eddy, NASA Earth Radiation Budget Experiment (ERBE) is a fraud – you seriously believe that. If you start playing this game you are clearly anti-science. The earth’s energy budget can be tackled and proven by multiple data collections and if you want to play this silly game in trashing all tools of instrumentation as some wild conspiracy – go right ahead. There are some very informative papers that support global warming in great detail. I have only posted a pin head of information or make that the indentation on the metal top of a pin head. To clear the decks it looks like I am going to have unravel a whole skeptical web site! Now that is no mean measure around here and I’m sure all would agree. I am still contemplating getting the WordPress blog application and start my own host on climate change to help you guys unravel the trashy science and false allegations from the good stuff. As far as I am concerned many web sites just convey trashy science and are conspiracy generating machines cranking more and more garbage. D.L. Royer (2006) “CO2-forced climate thresholds during the Phanerozoic” Geochim. Cosmochim. Acta 70, 5665-5675. W. M. Kurschner et al (2008) “The impact of Miocene atmospheric carbon dioxide fluctuations on climate and the evolution of the terrestrial ecosystem” Proc. Natl. Acad. Sci. USA 105, 499-453. Zachos JC (2008) “An early Cenozoic perspective on greenhouse warming and carbon-cycle dynamics” Nature 451, 279-283. Doney SC et al (2007) “Carbon and climate system coupling on timescales from the Precambrian to the Anthropocene” Ann. Rev. Environ. Resources 32, 31-66. Horton DE et al (2007) “Orbital and CO2 forcing of late Paleozoic continental ice sheets” Geophys. Res. Lett. L19708 (Oct. 11 2007). B. J. Fletcher et al. (2008) “Atmospheric carbon dioxide linked with Mesozoic and early Cenozoic climate change” Nature Geoscience 1, 43-48. YOU are going to UNRAVEL this website? You are kidding right. CGM’s – come on man. Climate models do not determine climate nor do I believe they should be used to quantify without min or max cone data ranges. It is those cone data ranges skeptics squeal about all over the internet. The recent article posted by Gaven on Real Climate proves that one. Try again – Of course Computer Modeling is in those papers – it looks at the empirical evidence and then plots the data. We need to differentiate before we can progress on this one. It is within the bounds to check past climate of the earth and plot C02 effects and sensitives on climate. My dear skeptic your alternative is ban all this science and investigation. That is madness and not really a logical and rationalist thing to do. I have cited a stream of papers about earth’s deep past climate history that PROVE C02 forcing and sensitivities are found in the historic record of climate. We will of course move on and revisit this topic from time to time as we examine the sensitivity of climate to C02 forcing. And that includes the delay of C02 too often shrilled up on skeptical web sites. D’Arrigo RD, Wilson R, Jacoby G (2006) “On the long-term context for 20th century warming.” J Geophys Res 111:D03103. Hegerl GC et al (2007) “Detection of human influence on a new, validated 1500 year temperature reconstruction.” J Clim 20:650–666. Lee TCK, Zwiers FW, Tsao M (2008) “Evaluation of proxy-based millennial reconstruction methods.” Clim Dyn 31:263–281. Viau, AE et al (2006) “Millennial-scale temperature variations in North America during the Holocene” J. Geophys. Res. 111, D09102. My alternative? how do you know my alternative? What makes you so presumptious? to add insult to injury you claim “That is madness and not really a logical and rationalist thing to do”. My alternative is to first and foremost STOP ALARMING PEOPLE. Continue with the scientific endevours without asking people to turn their world upside down. Exercise due diligence and good scientific principles. Don’t place conditions on the research. They are just some of my alternatives. And having exhausted my patience with obstinate goats, I will not respond to you anymore until you answer the many questions you left unanswered in both threads. I’m sorry Baa, but someone has to do but this web site will not be that site. I’ll be targeting an engineer who created a web site that is full of absolute misrepresentation and distortion in the graphing and data whereby he makes the false claim – he’s proven AGW does not exist. The fact that he is engineer qualified bears no reflection on that great occupation. I have never done that here. I have shown fairness to the science but the answer for mitigation will affect our economy. Agreed: The IPCC is not a science body – it is a COMMITTEE that uses science reports from all the over globe and presents them by its own internal peer review by independent scientists who audit from all over the globe. I am aware of no conditions placed on research I have posted. I’m sorry Ross, but I frequently cannot make sense of your posts. Can you tell me what or whom you are referring to in your # 43? So, the NASA ERBE program is a fraud? If you assume that NASA is producing fraudulent data when it comes to observational data what can you say about their climate model data? Is that the best you can do? You refer to papers based on GCM’s which are garbage in and garbage out. Did you read what I posted at 36? Let me refresh your memory since your attention span leaves something to be desired. I wrote “Then there’s Kevin Trenberth, the head of the Climate Analysis Section of the National Center for Atmospheric Research in Boulder, Colo. On Oct. 14, he wrote to the CRU’s Tom Wigley: “How come you do not agree with a statement that says we are no where close to knowing where energy is going or whether clouds are changing to make the planet brighter. We are not close to balancing the energy budget. The fact that we can not account for what is happening in the climate system makes any consideration of geo-engineering quite hopeless as we will never be able to tell if it is successful or not! It is a travesty!” They do not know what the energy budget is so they are incapable of modeling the climate. Don’t you comprehend that or are you obtuse? You disparage NASA and accuse them of fraud but swallow the global warming scam hook, line and sinker. You can’t have it both ways. Obviously you are incapable of deductive reasoning. You ignore what anyone cites when you cannot refute what they have to say. You still have not countered Steve Milloy’s destruction of NASA’s Jim Hansen calculations regarding the amount of heat he claims the earth is absorbing. If you would have checked the calculations in the papers you cited you wouldn’t have made a fool out of yourself. What about the link I gave you showing a graph clearly demonstrating the lack of any relationship between CO2 and temperatures over the last 600 million years? Your silence is deafening and speaks volumes about the depths of your ignorance. You quote the climate criminal and disgraced scientist Gavin (not Gaven) Schmitt? The guy who censors anyone who disagrees with him and calls him on his B.S.? At one post you rely on GCM’s to make a feeble case and then you disparage them in the next, don’t you get tired of contradicting yourself? You said, “I have only posted a pin head of information or make that the indentation on the metal top of a pin head.” I believe you should have said that you are a pin head who cannot provide any empirical data to support your outlandish claims! Until you can prove that the ERBE data is fraudulent and address the issues and argument that have been raised I am going to ignore you. You need to seek the help of a mental health professional or start taking your medicine again. Spare me the irrelevant cut and paste jobs from papers you cannot begin to fathom. Get a life! Allen (#21) No one else seems to have commented on the link you posted to the BBC program, so I will. This was the experiment carried out in the presenter’s kitchen, featuring a “renowned scientist” and with a cameo appearance by Sir David King: Two plastic bottles, one with normal air and one with extra CO2 pumped into it. Two lamps representing the sun warming up the contents, and temperature sensors attached to each. Lo and behold, the bottle containing extra CO2 warmed more than the other. Case closed, AGW proven, apparently! The experiment was deemed “completely unscientific” even by the presenter himself! The audience (about 12) was made up of “a cross section of the British public” (previous BBC studio audiences incl. participants from Top Gear. I’m not making this up, just quoting from the clip). They interviewed 2-3 of the audience prior to the experiment, and the same people after. One guy who claimed to be sceptical, as in “I really don’t know who to believe”, before the experiment professed total conversion after the experiment. One girl asked David King about the CRU emails and he proceeded to slam the method and motives of the “hackers” and didn’t answer her question about the damning evidence at all! Pretty much everyone swallowed the experiment although some were still “sceptical” as to what they could do about man made global warming. Given the nature of the experiment (you really need to see it to believe it) and the disclaimer (“it’s totally unscientific!) I am absolutely gobsmacked that people fell for it holus bolus. I am afraid that this is level of scientific ignorance and gullibility that we are dealing with in the general public. We have a long, hard road ahead of us, and Frank S (#2) is right: The AGW proponents have already started to sidetrack into ocean acidification. We won a reprieve in Copenhagen, but we cannot afford to rest on our laurels. You still haven’t responded to the primary question to be answered within this thread. When causality is operational between two factors the factors will exhibit a correlation. However, to demonstrate that the causal connection exists, one must present a mechanism for the connection and demonstrate the mechanism is actually in operation within the given circumstances. Then, once that is demonstrated, one must demonstrate that the cause occurs BEFORE the effect. Your ravings are devoid of evidence of causality, mechanism for the causality, or a demonstration of the direction of causality. I believe Eddy was suggesting that the ERBE results were falsifying the theory of strong positive climate sensitivity to temperature changes that all of the GCMs have been assuming rather than that the ERBE results were a falsification. The ERBE satellite have been used by a few researchers to date to conclude that climate sensitivity to temperature rises are considerably lower than the GCM modellers have been assuming. As you probably that Richard Lindzen and Roy Spencer are in disagreement as to the reliability of Lindzen and Choi’s results but being scientists they are communicating their disagreements and getting on with their analysis of the data. The resulting debate between the parties is an integral part of the scientific method. The reason that we can not trust some of the main proponents of AGW is the fact that they do not appear to adhere to scientific method. Indeed some of the IPCC scientists are more interested in modifying or selecting data to suit their theories than modifying their theories to fit their data. In addition they have conspired to “hide the decline” and to avoid FOI requests from those who do not share their alarmist view of our planet. In short they have confused their own politics with science and the two do not mix well. Thanks for the clarification at response 52. I didn’t realize that Ross is so ignorant that he doesn’t know what the word “falsification” means. Proponents of AGW/CC when backed into a corner will use the excuse of capitialism to explain the base root of climatechange. Self-interest and greed has caused two distinct changes to our planet, survival of its 6 billion + inhabitants and with it change to our environment. Environmental change comes in two categories, and I hate to use these mainstream terms, sustainable and unsustainable. Environmental change is in many ways subjective. If one replaces a prairie with farmland, the planet doesn’t care. Only man through his perceptions cares. So sustainable changes are ones man is OK with and unsustainable changes are ones he is not. Man can change unsustainable changes into sustainable ones through through clear research, focus and effort. Agreeing to which is which is another story. What happens is man’s unsustainable activities are used by AGW/CC proponents to lump on top of the AGW/CC arguement. However, it is appearing the planets long term temperature changes may be a separate mechanism from what is going on its surface via man or nature. Empirical science vs. proponentry. Which has served man better??? C. Andy: Empirical science vs. proponentry. Which has served man better??? That depends upon your goal. Remember the Twilight Zone episode entitled “To Serve Man“? The punch line was “It’s a cook book.”. At least the papers Ross is quoting actually appear to be doing Science! To me, papers that say, “we attempted this, and it didn’t work”, or “we have tried all these things, and still cannot explain the results” are actually much more useful than the “eureka” moments. Real research is defined by the wide spaces of what we do not know, than the few islands of stuff that we do know. The problem is not what is written, it is how it is interpreted. Those with a taste for the politically dramatic ignore the scientific intent of these papers, which is to reduce the domain of what we don’t know, and spout the recorded observations as something that we do know. Real scientists do not just publish success stories. It has been said (although I can’t remember by whom) that a scientists reputation is based on the number of peer reviewed papers published in prestigious journals not on the discoveries presented in those papers. The problem is in the education system. There seems to be a shortage of good science and maths teachers, at least in the UK, Australia and New Zealand. The government response to this is to reduce the level of science and math in the curriculum. Of course this flows on into University, where students try to select degrees that do not have a reliance on Math (International Studies, anybody? ), so they come out of university thinking that computer models, “like do stuff, that is like, real, an’ the truth, an’ that”. Sorry, it is a hobbyhorse. I do not think we will all die from climate variation, but we may well die in the collapse of civilization under the weight of our own incompetence. … some of the IPCC scientists are more interested in modifying or selecting data to suit their theories than modifying their theories to fit their data. I feel uncomfortable responding to Darryl Biehn’s opinion piece calling global warming “dubious” because I am not a climate scientist, but Biehn should acknowledge that he isn’t either. He has done research, but evidently from biased sources. What do scientists in the field who really know the debates have to say? According to that radical lefty rag The Wall Street Journal, Dec. 7 edition, a survey of 3,000 earth scientists found that 82 percent agree that human activity is “a significant contributing factor” in rising temperatures. Among those who actively publish in the field, 97 percent agree. Yes, there can be conformity in science, but to pressure scientists to come to an unacceptable conclusion is much like herding cats. What is most wrong with Biehn’s letter are his conspiratorial insinuations. An example: That the Intergovernmental Panel on Climate Change wields a disproportionate influence through political power and money. Since when do UN commissions have power? He and other skeptics ignore the active suppression of climate science during the Bush administration. He further ignores the powerful business groups that block action on climate change and incidentally fund climate skeptic groups. I do not have space to address scientific issues brought up, such as whether warming happens before or after carbon increases, or the solar cycle hypothesis. But it is wrong to say these issues are ignored in climate change literature. Global warming presents a fundamental challenge to democracies: Are we able to address a threat to our civilization that is not immediately upon us? The article ends by saying Fraud: it is the one constant in the history of the global warming hysteria movement. Ross_Brisbane:Come on Eddy, NASA Earth Radiation Budget Experiment (ERBE) is a fraud – you seriously believe that. No it may not be a fraud, but what exactly has it proved? Remember there are many explanations for a phenomenon other than CO2 done it. The trouble with many “Climate Change” studies is that they assume their conclusion. The very antithesis of science. 2. That the only major driver of climate is CO2. Which is not only not proven, it is not even reasonably true. For 12 years the Earth has failed to warm even as we pump in CO2 in ever increasing amounts into our atmosphere. The Wizards of Oz are humbugs. As they have privately admitted, they dont have a clue. Maybe you could help them out? Your “Climate Evidence” graphic speaks volumes! The “evidence” (that CO2 matters or is harmful) is neatly summed up by that graphic at the top of the page. I agree that it does present a fundamental challenge to democracies, but not from any imagined threat “that is not immediatly upon us”. The fundamental threat to our democracies is the imposition of laws and tax by decree by an unelected body. Laws that weaken us and threaten to destroy us by undermining our ability to produce energy to power our farms, our cities, our vehicles and our homes. One of the landmarks of democracy was the “Boston Tea Party”, where the foundations of American democracy were laid with the slogan “No taxation without representation”. Our freedoms have been hard fought and won and can never be taken for granted. Eternal vigilance is the price of liberty. I understand there is evidence of temperature measurements. There is also evidence of CO2 levels in atmosphere. Despite the measurement issues, there appears some correlation. Or perhaps its the contrail effect of jet fuel http://en.wikipedia.org/wiki/Contrail (edits by Connolley to create warming from cooling) see: Vapour trails or contrails and climate. This is the best CO2 greenhouse experiment I have seen so far. Still has methodological issues. Surely someone somewhere with lots of money has done a similar experiment and had the results published. I’ve said it before and I will say it again, there is no empirical evidence to support the AGW theory. How could there be? There is only one planet earth so that rules out a double blind study, the geological record of CO2 and temperatures become less reliable the further back in time you go and the theory has been falsified in so many ways it is mind boggling that anyone can still buy into it. The only reason that anyone tries to keep the theory alive is to promote their own financial interests. There is too much money at stake and money leaves a trail. The climate criminals at the CRU, Penn State, NCDC and GISS may be able to foil a FOI request but when the FBI executes a search warrant they do not accept lame excuses such as “we lost the data.” In the information age there is almost certainly incriminating evidence that will turn up somewhere. If these guys were so sloppy in fraudulently altering computer code does anyone think these arrogant prima donnas were smart enough to totally erase the electronic trail they left behind? In the U.S. the Republicans are smelling blood and Penn State is in Pennsylvania, a state where the congress is controlled by Republicans. The Republicans are already threatening to cut off Penn State’s funding if they whitewash their investigation of Mann. Since Mann will have a hard time bringing in Grant money as a result of climategate I have no doubt that he will be sacrificed. He said he didn’t destroy emails but it is obvious from the CRU emails that he did just that. Weasels are imbued with an instinct for self preservation seldom seen in the animal world. Now, even the carrion fowl at the mainstream media have begun to turn on those they once worshipped. I am still predicting indictments will be handed up this year in the U.S. Does anyone no if there is a betting line on this in Las Vegas? Yes, indeed Eddy @ 64. These things have a habit of unravelling in the most unexpected way. Until Ross posts what he believes to be the falsifiable part of the AGW hypothesis we should all just let him bang on to himself in the padded room. His sort won’t ever do that, of course. It’s always the “moveable feast” or the constantly “moving goalposts” routine with them. Anyone remember the “hotspot”, the “warming top 75 metres of the oceans”, now it’s oceanic adidification. Each and every canard knocked down by opposing or lacking empirical evidence. One can only wonder what the nest one will be! I’d suggest it’s anything at all to drag the debate on while the UN global tax agenda moves along. Fox repeated their AGW programme last night. Good stuff; the more people who see it, the better. I wonder if a fellow blogger or Jo can help me with this. I’ve been trying to learn more about General Circulation Models GCM’s. Afterall, the GCM projections (the IPCC is very careful not to use the term “prediction”) are the so called “proof” of impending disaster for us all. What struck me was that I am having lots of difficulty finding error margins for these projections in the IPCC reports. I’ve had to dig deep into supplemental papers to find some, but even they are presented vaguely. Why is this important? If my understanding of how a GCM works is correct, when you ask it to project 100yrs into the future, any error bands in year one should increase equivalently each year there after, rendering the 100yr projection useless in most cases. e.g. If a forcing has an error margin of 10% in the first year, this error margin would be 20% in year two would it not? If the above is true (help) then any projection more that 2 or 3 years out is worthless, certainly not “evidence” enough to make public policy. Can you imagine this depicted on a graph? the error shading would dwarf the actual projection and look less “alarming” but more truthful. Maybe someone with the resources could plot a graph of a couple of IPCC projections. This is a good read. Does anyone have any info on the involvement of Goldman Sachs, David Cameron, and the New Zealand government? It seems so strange that the conservative British opposition leader and the New Zealand government are going along with the scam. It could just be an attempt to neutralise the issue, but maybe not. This post rehashes old ground. However, it presents a reason why there is no evidence that can be presented to answer the central question of this thread. It would be contradictory to the Three Laws of Thermodynamics and the Gas Laws. Commonly held perceptions of the climatic relevance of CO2 and other so-called greenhouse gases rest on a staggering failure to grasp some of the fundamentals of physics. Correct interpretation of the Second Law of Thermodynamics and sound appreciation of the necessary physical conditions for emission of radiation by gases lead to the understanding that within the troposphere no backradiation can be caused by so-called greenhouse gases. Therefore it is not at all correct to speak of a thermal effect of these gases on the biosphere. It is completely incomprehensible and unjustified to imagine that mankind can or must protect the climate by attempting to control trace amounts of CO2 in the air. In other words, the authors argue that there is no such thing as a greenhouse effect nor a greenhouse gas in the earth’s atmosphere. This is true in the strict sense or a mildly appropriate metaphorical one. Reduction of CO2 emissions will have no major effect (no measurable effect?) on global temperature. This artical presents reasons behind why there is no evidence that can be presented to answer the central question of this thread. If the system is chaotic then yes the error diverges as you describe, which is the fundamental feature that bounds the prediction of weather. It’s a rapidly diminishing return considering how small you have to make the “now” errors vs how far into the future you can meaningfully predict. For systems that are not chaotic and converge to a stable state, the error also converges to a stable value and this problem does not occur. The basic presumption in climate research is that those features that can be found to converge to a stable value are part of “climate” while those features that are chaotic are part of “weather”. For example, rainfall on any one day will go up and down in a chaotic pattern. However, average rainfall over a sufficiently long period and over a large physical space (e.g. a whole state) will show only minor variation. The key here is “sufficiently long period”, and that’s a rather arguable value. As it turns out I have a concrete example. If you look at Australian rainfall, you see the 100 year chart in Figure 4a on page 9, including a black line with an 11 year moving average. The black line has less variation than the yearly rainfall, but yet the black line does show some variation and indeed some decades are worse than others (so it is with chaotic variables). Now the Figure 4b is not immediately comparable with Figure 4a because the wetter areas (thin band along the East coast and patch up in the Northwest) tend to show greater absolute variation, while the drier patches show less absolute variation. Let’s go with ballpark estimates, and judge by eye that the yearly variance in Figure 4a is something like plus/minus 15% up to perhaps plus/minus 20% and if you take my word on where the wet parts of Australia are, we could say that in Figure 4b the “trend” over the long term has been a change of somewhere around plus/minus 1.5% up to perhaps plus/minus 2%. Now, we have 100 years, and one sample per year so presuming the rainfall is a simple stochastic random variable, basic statistics ways that the standard deviation is in proportion to the inverse of the square root of the number of samples. In this case 100 samples gives a factor of 1/10 and the standard deviation over the 100 year average would be approx 1/10 of the single year case. Indeed 20% divided by 10 is 2% so this does roughly fit the behaviour of a perfectly random variable. For extra background note that stochastic random variables have a “white” spectrum (equal energy at all frequencies) but chaotic variables are typically a bit redder than that (more low-frequency energy) and their spectrum is not a simple shape so we would expect the average of a chaotic variable to be worse than the “inverse square root of number of samples” rule. Exactly how much worse is very much a property of this particular type of chaos. By the way, the TV news did indeed mention (in passing) that this was the wettest Christmas in Australia for 15 years or so. It’s certainly gearing up for a rainy summer all through the Southeast and I believe a bumper wheat crop too (most of which will be shipped into Asia and the Middle East). Thankyou Tel, that was informative. So in my 2nd post #69 re: cloud albedo, (I’m assuming is chaotic) the error bars by year 100 would be huge? I reckon if we had a good QC on our side, we could try and sue Rudd and Wong and Flannery under terrorism laws. If I was to cry “the world is about to end” in an airport, I’d be taken away by the feds not to be seen or heard from for 30days. GISS collects cloud coverage data as seen from satellite (George has a link for downloads) but not 100 years (for obvious reasons). Cloud coverage over a given patch of earth would be chaotic, and thus attempting to predict whether that patch is covered or not in a few years time would be very difficult. However I believe that overall cloud coverage over the whole earth tends to average out (i.e. more clouds in one place means less clouds elsewhere, but I don’t have the details in front of me). Again, if you consider cloud coverage over one week, vs coverage over one year the per-week value will have more variation, so which is the real “climate” value? Depends very much on perspective. I believe you can download the data and make a graph, might be worth tinkering with to see what sort of trends exist in cloud cover. I used cloud albedo as an example only. Reading thru the AR4 I thought it was unusual that some graphs and tables don’t show error range, or they refer the reader to another volume to find the error range. I just thought a graph showing (temp for instance) may look rather dodgy if in the year 2100, a 3degC rise was projected with a plus minus 30 degree error range. It’s just that whenever I’ve read a paper or seen a table, plus minus error range was shown. Not so in some IPCC graphs and tables. Some even show what’s labelled “likely range” as opposed to error range. Having worked on and managed an area of forecasting that was very cloud dependant – road ice, I know that even synoptic models are not always that good at cloud cover for one place and one night. Imagine having to explain that to an angry customer. Still – cross my palm with silver and I will tell you what your climate will be like in 75 years time. Please form an orderly queue!!! Thanks for your insights – very informative. I only have a UK “A” level in statistics (from more years ago than I care to contemplate), so I could be a giant amongst Alarmists, couldn’t I??? There is some very clear research and evidence about how the climate changes, unfortunately it has nothing to do with CO2 or man. for a summary of the work of Dr.Henrik Svensmark that has provided a complete theory with research evidence on Climate Change. This first video is about 9 minutes long and it starts off in the Danish language with English subtitles, then after a minute or so switches to English. Way beyond my abilities, but I get the gist of it. Wow. unless I’m a little behind of course? I only need to quote Hansen himself to weaken the CO2 theory. We suggest equal emphasis on an alternative, more optimistic, scenario that emphasizes reduction of non-CO2 GHGs and black carbon during the next 50 years. This scenario derives from our interpretation that observed global warming has been caused mainly by non-CO2 GHGs. People tend to forget about the Montreal Protocol. All those nasty things that were causing certain doom that were banned in the Montreal Protocol are now dropping out of the atmosphere. One can explain the current cooling cycle using ‘Global Warming Theory’, the Montreal Protocol worked and CO2 was over estimated and some of the other gases were underestimated. 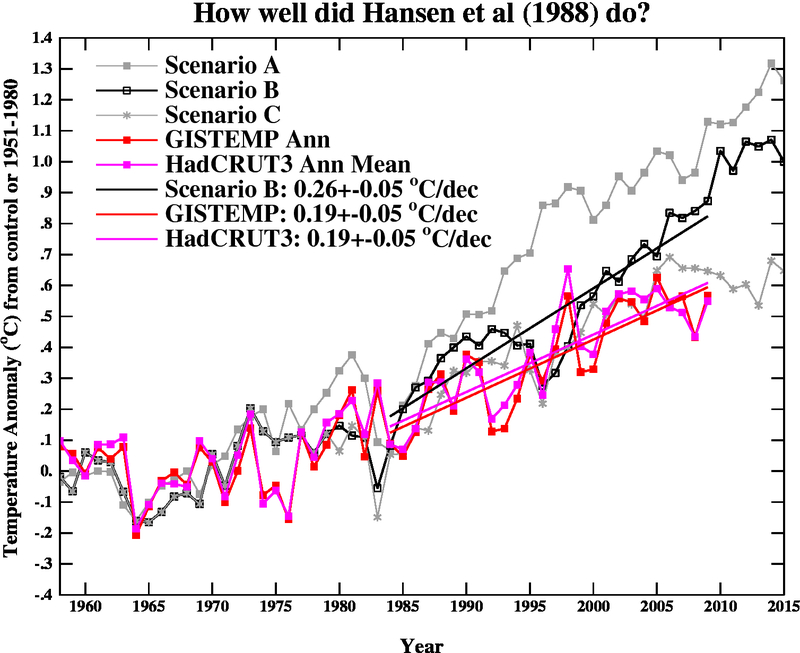 Hansens 1988 Projection had 3 scenario’s. A) Do nothing about CFC’s etc, B) Do something about CFC’s etc but nothing about CO2, C) do something about CO2 and CFC’s. The actual observed temperatures have been tracking with the Hansen ‘C’ scenario. Thanks for bringing pointing out this very illuminating article. It meets the criteria I pointed out in post 33. The gist of the article is that there is no analog of an actual greenhouse effect in the atmosphere, there are no greenhouse gasses that trap heat, there is no possibility of producing a physically meaningful simulation of the climate system, AND there is no statistical method by which weather can be translated into a physically meaningful measure of climate. In other words, AGW is false to fact, false to theory, false in practice, and deeply misleading in language. Ditto for *climate change* in which the actions of man causes it on a global scale. cannot be answered by any physical meaning other than NO! Unfortunately, the alarmists have gotten away with an argument equivalent to “look out your window, do you see the earth as a sphere? I thought not. The earth is flat!”. A full discussion of the issue is not as simple as “look at a greenhouse, the atmosphere works the same way, hence, the CO2 emitted by human action is going to cause catastrophic global warming and we have a computer simulation and a consensus that proves it.” It is long, complicated, heavily mathematical, includes consideration of a wide range of theoretical and experimental physics, and is anything but obvious to the casual observer. How can we expect, in an MTV age where a 15 second sound bite (tweet) is the preferred means of communication, to make our case? I suggest our start is to inform those for whom a 15 second sound bite (tweet) is a very insufficient means of communication. They would be the one’s who are looking for the truth and are willing to consider a wide ranging discussion of the issues BEFORE they make up their minds. I have no strategy for the citizens of the MTV 15 second sound bite alternate universe. What seems to be working here is to write to your representatives. Don’t just click on a form-letter, but think for a bit and write down what it is you’d like them to do. I have heard back from two of my three congress-critters. One of them noticed that the AGW people all say the same (scripted) things and the skeptics take the time to explain their position. Be polite and respectful and I’ll just bet they will pay attention to you. This applies to the media as well. They may be slanted the other way, but when faced with well-thought-out opinion they are pretty much speechless. I was lucky enough to get a “true believer(t.b. )” to ask a question of Jim Hansen at a lefty presentation. He wouldn’t tell me the reply and “assured” me that AGW is accepted by all the “quality” scientists. I had quoted Freeman Dyson and Edward Teller, so apparently, t.b. questions not just my quality, but that of two top-notch physicists as well! Is anybody familiar with the background to this? Wow, had no idea the link was that long! Without CO2 we would not have any plant growing on earth, so no Life on earth at all. In the air ist 0,038% CO2 available. 1,2% is made bei burning of fossile energy. It means humans are responsible for 0,000456%. Any questions? Have a look on to this homepage http://www.klimamanifest-von-heiligenroth.de and take the english version.Best regards and an interesting new year. Is there a way of cross checking those calculations? I find that the qualitative arguments based upon the Three Laws of Thermodynamics, the Real Gas Laws, and several rather simple experiments are sufficient to make the case. The conclusions do not stand or fall based upon the theoretical math derivations. This is why I knew that AGW was bogus in the late 1980′s. A trace of a trace of a single component in the atmosphere cannot cause a catastrophic run away effect. This is further re-enforced by the geological history of the earth and by the fact we are here discussing the matter. In order to cross check the quantitative/theoretical portion of the paper, one would have to verify each and every derivation and calculation. Unlike the AGW alarmists work of over three decades plus, sufficient information is given to do that. Unfortunately, the theoretical physics and math is quite non-trivial. The technical challenge is sufficient to require a specialist in the field to do it. I am a science and technology generalist. I would have to spend a lot more time and effort than I care to spend to prove the theoretical foundation behind what is already proved by more direct qualitative and experimental means. However, there is sufficient information available in the paper and in the scientific literature for anyone who wishes to make the attempt. Truth is not in the complexity and difficulty of a theoretical argument. Its in the simplicity of real world observation and experimentation. Here is a plain language version of a greenhouse falsification, which is very clear and readable and makes sense. Full page well worth a few minutes. I note the description of the woods experiment explains why the experiment described (http://www.espere.net/Unitedkingdom/water/uk_watexpgreenhouse.htm) has problems. “foolmeonce” disputes Peak Oil by refering to the abiotic theory of oil creation. Let us assume this theory is correct. However in order for us to keep increasing oil production, the crust must make enough oil to meet this demand, and put it in readily accessible locations. So the crust made billions of barrels of oil over many millions of years, and then when we start extracting it, and suddenly the crust is going to make more of it, quick enough to keep up with demand. Just look at world production data and the history of ever-smaller oil field discoveries and you will see it doesn’t make a drop of difference if the oil is made by the crust or not. If the PhD’s and economists won’t explain this to the public in english, then I will. I remember watching a documentary that was looked at the Bermuda Triangle myth. The cruxt of the story was that it was more expensive to insure a craft for travel through the China sea than the Bermuda Triangle. Which means the insurance industry has looked at the data, accesed the risk and, well, there is no more risk in traveling the Beruda Triangle than any other similar`waterway. What about all those “Act of God” clauses in insurance policies? can’t they now be attributed to AGW or man made climate change? It would force the insurance industry to have a good hard look at the issue of money was at stake? Hence evidence, while already surfaced, would get coverage? I understand what your saying but I’m not sure you understand where I’m going with it. Claim to insurer for damages. Insured counters with man made climate change caused the damage, with the scientific consensus being that our climate is now under the influence of man. I’m guessing the UN and Australian Government would inline for the sueing being they hold all the climate cards, and have known for years that man has been influencing the climate. Maybe even industry groups? I just want to say thanks to everyone here. I’ve learned so much from each and everyone of you and looking forward to learn more about the complexity of climate change. to quote from the article “The bitter winter afflicting much of the Northern Hemisphere is only the start of a global trend towards cooler weather that is likely to last for 20 or 30 years, say some of the world’s most eminent climate scientists. The scientists’ predictions also undermine the standard climate computer models, which assert that the warming of the Earth since 1900 has been driven solely by man-made greenhouse gas emissions and will continue as long as carbon dioxide levels rise. Among the most prominent of the scientists is Professor Mojib Latif, a leading member of the UN’s Intergovernmental Panel on Climate Change (IPCC), which has been pushing the issue of man-made global warming on to the international political agenda since it was formed 22 years ago. Prof Latif, who leads a research team at the renowned Leibniz Institute at Germany’s Kiel University, has developed new methods for measuring ocean temperatures 3,000ft beneath the surface, where the cooling and warming cycles start. He and his colleagues predicted the new cooling trend in a paper published in 2008 and warned of it again at an IPCC conference in Geneva last September. Where is the evidence? Is there any? 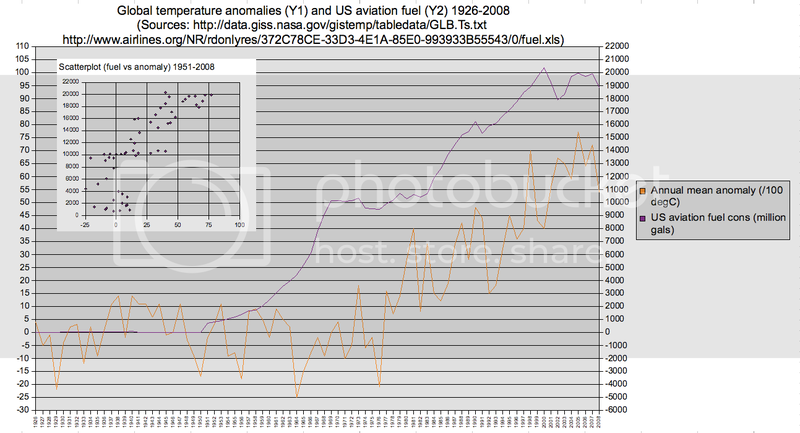 Has anyone been following this guy and his Raw Data temperature analysis? No, but we should be. Very interesting. Maybe you should post it in a new thread so more will get to see it. CO2 is a greenhouse gas, known for 150 years. That humanity could potentially affect the climate, known for 100 years. That it could be problem, known for 60 years. Humans have caused CO2 levels to increase to the highest level for the last 800,000 years, at least, and maybe 20 million. If anything the climate is even more sensitive than the climate models have been using, slow feed backs have been underestimated. The troposphere warming while the stratosphere cools is but one of the fingerprints that the current warming is anthropogenic. The climate has changed and further change is already locked in. Inevitably we have caused changes that will stress society’s ability to adapt. Sticking your fingers in your ears shouting “not true not true” will prove an ineffective adaption strategy. New Sydney Airport, better start now. Actually no – it would be evidence that 500 players think the rules need changing. The great big map of FUD | Watts Up With That? Science is based on “the Scientific Method”. A hypothesis or theory is formulated, then evidence is sought to support it. Man caused global warming is one such theory. Billions of dollars have been spent attempting to find evidence to support it. There is no question that the Earth has warmed over the past 300 years since “the Little Ice Age”. How much of this warming, if any, has been caused by man’s carbon dioxide ? If man’s carbon dioxide has added to this natural warming, it should be most evident after World War 2, when fossil fuel consumption increased by a factor of 12. Here’s a list of what has been claimed by alarmists to be evidence of man’s contribution to warming. 1. The International Panel on Climate Change’s (IPCC) selection of computer models. This is a popular favourite. However, as even non computer experts know, garbage in=garbage out. A model will output whatever the programmer tells it. 2. IPCC models predicted stratospheric cooling, that is cooling in the upper layers of the atmosphere. This was very popular with alarmists a decade ago. Oops … the stratosphere has now been warming for the past 15 years. Strangely, alarmists have gone quiet on this now. 3. IPCC models predict a tropical troposphere “hot spot”, that is a warm region in the lower atmosphere over the tropics. Ooops … no one has been able to find it, despite much searching. 4. IPCC models back in 1995 predicted alarming warming. Ooops … the man responsible for IPCC climate data, Dr Phil Jones, has admitted on BBC interview and on Hansard, to parliament, that there has been no warming for the past 15 years. The IPCC’s models have clearly been shown to be in error. 5. Dr Phil Jones has his own evidence: “The fact that we can’t explain the warming from the 1950s by solar and volcanic forcing.” In other words, we don’t understand the natural forces causing warming and cooling of the earth for the past 4 billion years, so it must be our fault. 6. Al Gore’s ice cores in his Hollywood disaster movie, widely promoted by our local councils. Ooops … Mr Gore forgot to mention that ice cores show that carbon dioxide increases follow warming. That is, they are a result of warming, not a cause. 7. Michael Mann’s fraudulent “hide the decline” “hockey stick” that tried to do away with the 11th century Medieval Warm Period. Ooops … over 400 papers show that the MWP was real, global and hotter than now. In fact areas such as Greenland were warm enough to support cattle and crops. 8. IPCC lead author Dr Kevin Trenberth claims the key evidence is sea levels. Too silly for words. Sea levels have been rising at a decreasing rate rate for the past 8000 years. 9. “Extreme weather”. Now it’s getting really silly. There’s not even any plausible theory for this nonsense. People get sucked in by newspaper headlines. Tropical cyclones are now at a 30 year low, although you’d hardly believe it from the press. 10. Rapid warming. Ooops … warming was faster between 1910 and 1945 than any subsequent period after 1945, when man started spewing carbon dioxide in earnest. 11. The final one is hardly scientific but I’ve heard it from so many people. The government told me so … and politicians never lie, do they ? Variations of this one include “scientific consensus”. Over 30,000 scientists have signed a document stating that man caused global warming is a scam. However, “consensus” can never be considered as evidence of any kind. Politics, not science, is not based on votes. In other word, there is not a shred of evidence that any of the warming over the past 300 years since the Little Ice Age, is due to man’s carbon dioxide. If anyone claims there is some other evidence for man’s contribution to warming, hidden away on an alarmist web site perhaps, we’d all love to hear about it. Gee, hope you guys are right. If not, we failed to do enough about a real problem that, if 97% of published climate are correct, will mean the unraveling of a civilization. AS the American Meteorological Society states, it is prudent to care for the only planet known to support life. I have no question that for most of you, no evidence would be sufficient. That indicates a bias, I think. Yes Jfreed I agree, you seem to be biased. Many ‘drive-by’ commentors on this site have been challenged to supply the evidence (any evidence) that CO2 is responsible for the current warming (which seems to have stopped ~16 years ago). I doubt you will be the first to find any. Since you bring up prudence, it isn’t prudent to act on hypotheses (AGW) that have exactly no empirical evidential support. I don’t know how much evidence other skeptics would need (to accept that AGW represents a problem) but, for me, zero evidence isn’t enough. Apparently, you aren’t so picky. I believed we should worry about CO2 for 17 years. Caring for the planet and the people means looking at the data from the real world. Those who don’t give a toss look at the data from computer simulations instead. They call themselves scientists but act like activists. Since AGW is lacking any sort of confirmed imperical support or proof surely it is NOT A THEORY, at best it might be a weak hypothesis, very weak – hmmm … in fact in any other feild of Science it would have been rejected years ago!! And if AGW is just a week hypothesis then CO2 caused AGW is a dumb spit in the eye!! I would really like to see you revisit your post above and update it for current information it is nice to follow how the evidence is accumulating. The evidence the IPCC has always used to ‘attribute’ global warming to human activity is that their programmed models (CMIP3, I assume) could not accurately hindcast the warming of the last 50 years unless external forcing of Xw/m2 is assumed. As the IPCC only knows of three potential sources for this forcing, and it didn’t come from variations in volcanoes or solar irradiance, it must have come from variations in greenhouse gases. Many have pointed out that this says a lot more about both IPCC models and/or scientists’ ignorance of climate drivers than it does about fossil fuels. The major weakness of the models is that they’ve never made any attempt to analyze or understand natural internal variability (such as ENSO, AMO, etc) relying on assumptions that all these natural events cancel each other out over time (but, how much time?). However, this attribution argument has long been accepted as persuasive, particularly as the atmospheric warming has broadly coincided (with lots of lags and leads) with 50 years of increasing CO2 concentrations. But everything has changed in the last few months! Specifically, the model simulations have been proven wrong – by a country mile. We now have even “Nature Climate Change” publishing a study (by WG1 luminaries) which shows that a combination of errors have caused CIMP5 models to be wrong by 400% over the last 15 years. A stack of papers have established that the climate sensitivity used by the models has been exaggerated by 50% or more. Several years of global cooling have been attributed to once-ignored natural variation (La Nina and probably the PDO). So now it’s all back to square one for WG1 of the IPCC. Their new attempt at attribution is to be revealed later this month. The Planet Venus has an atmosphere that’s 96% CO2 and the surface temperature is around 500C. By comparison the planet Mercury has a surface temperature around 425C. At the same atmospheric pressures in Venus’s atmosphere as those that occur in Earth’s atmosphere, Venus’s atmosphere is EXACTLY the temperature it should be relative to its distance from the Sun. There is NO CO2 warming on Venus.. NONE, get that….. NONE !!! Do these guys get these factoids off the back of their breakfast cereal packet?